Cormoran is the name of JK Rowling’s newest leading man. It’s also the inspiration for our Baby Name of the Day. But we know this giant as a villain. Jack, the boy who climbed the beanstalk, has its roots in a Cornish tale, and Cormoran was the original giant that Jack slayed. There’s debate about whether the giant’s name is Cornish. It might be based on Corineus, the legendary warrior founder of Cornwall. When I first heard this name, I thought bird. But that’s cormorant, with a t. They’re coastal birds, built to dive for fish, and they’re found nearly everywhere in the world with an appropriate habitat. Their name likely comes from the Latin phrase corvus marinus – sea raven. Most assumed that they were cousins to corvids – ravens – thanks to their size and coloring. I’m not the only one to notice the similarity between the name of the bird and the giant, but it’s probably a coincidence. In French, the bird is called the cormoran, hold the t. In the 1990s, it was the name of a French language drama produced in Quebec, set during World War II. It’s the last name of the family at the heart of the story. How do you follow a series like Harry Potter? JK Rowling decided to write detective fiction under the alias Robert Galbraith. In 2010, she introduced the world to failing private investigator Cormoran Blue Strike, the son of a rock star dad and groupie mom. In the first book, he’s hired to investigate a supermodel’s so-called suicide. In the course of the investigation, Strike ends up with a temporary secretary, Robin Ellacott. She eventually becomes his right-hand man. 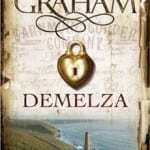 There are three books in the series so far, and word is that the BBC is adapting the novels as a television series. Rowling has said that there could easily be seven books in the series. But since Strike doesn’t have to graduate from Hogwarts, and since his business is doing much better in the last book or two, there’s no telling how long he could go on righting wrongs. Cormoran: But is it a name? In the US, Cormoran is so rare as to be non-existent. It’s never been given to even five boys in a single year. More surprisingly, I couldn’t find any men by the name in US Census records. 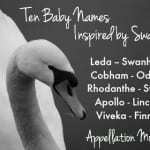 Or maybe that’s because it’s not really a given name in Cornwall. 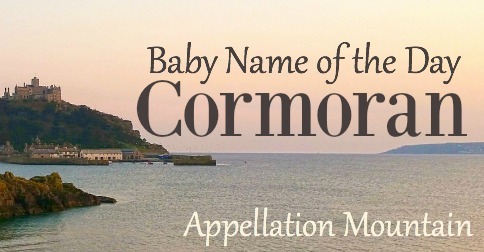 It’s not on British Baby Names’ overview list, and neither does the Cornish Language Partnership. Then again, Cornish is a language that’s been revived over the last century. It’s possible that Cormoran was never used as a given name in Cornish – after all, there’s speculation that the giant’s name has roots in another language. And most tales describe the giant as hideously ugly and cruel, so maybe he wouldn’t have been a likely namesake anyway. Today, there are reasons to think this name could succeed. It’s a longer name for boys, similar to Benjamin, Sebastian, and especially Cameron. And the magic of JK Rowling means that it is more familiar – and recognizable – as a name than ever before. If you’re after a daring rarity, Cormoran might be one to consider. 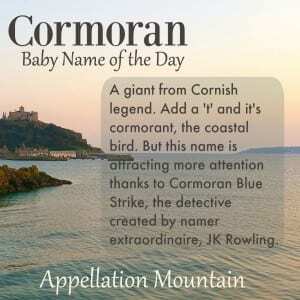 What do you think of Cormoran as a given name? My mind goes immediately to the Comoros Islands off of Africa. The language is Comorian, really close to this name. Also moran is so close to moron, that I wonder if it is usable. I couldn’t find any record of it being used anywhere in the past six hundred years – it’s a true rarity! Fascinating! I’ve not come across the name before, or the character. I can’t find any record of it being used as a given name in Britain in the last three centuries. Now that is really interesting!